We have featured a number of DIY and homemade alarm clocks here at Geeky Gadgets, the latest one is the creation of Mike Krumpus from Nootropic Design, the Defusable Alarm Clock. 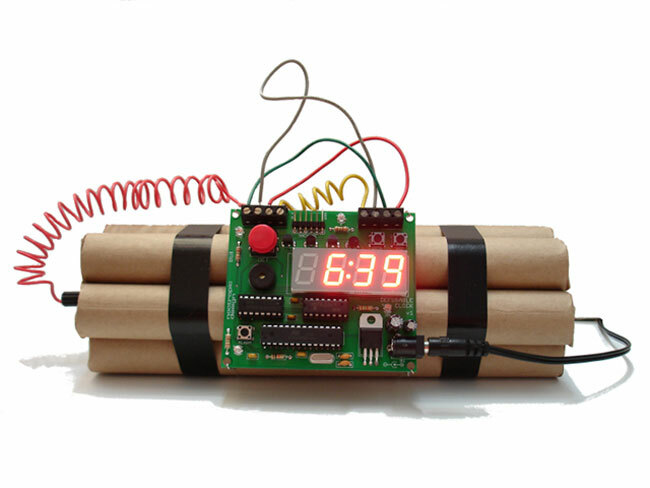 As you can see from the photo and video below, the Defusable Alarm Clock is designed to look like a bomb, and it is a fully functional alarm clock, the only way to shut it up when it goes off is to correctly diffuse it. The Defusable Clock is a fully-functional alarm clock just like you’d expect (a normal beeping alarm, snooze alarm, etc.). But at any time you can press the big red button to start a scary countdown sequence exactly like bombs in Hollywood movies. There are 4 wires across the top of the clock. You have 10 seconds to choose the correct wire to cut: one wire stops the countdown and saves the day, two have no effect, and one will “detonate” the device immediately. You can find out more information on the Diffusable Alarm Clock over at Nootropic Design.